I fell in love with this venue because of the location and how stunning it was! Not only did the venue include a lot of amenities and supplies to make our day everything we wanted it to be, working with Julie and her staff made our wedding so much more special! Julie is amazing and caters to the needs and expectations and made our day come together perfectly! I have no complaints our wedding was incredible! Julie was incredible through the entire process! I couldn't have asked for a better day! Would recommend for any occasion or event! My husband and I had such an amazing experience here at the McCreery house! Julie was incredibly helpful with finding vendors and had so many recommendations. She really took her time to know us and our taste! She met up with us throughout all of the months until the actual date and always offered some sort of help! We got married in the beginning of September and the venue was beautiful she has so much greenery and different kinds of flowers everywhere. We had the BEST experience with Julie and The McCreery House. From the very beginning of planning, she was an absolute gem to work with. Throughout the entire process, from the day we chose the venue to the day of the wedding, she was with us 100%. She continually checked in, making sure we were checking everything off our list and offering her assistance. Meetings with her are professional, fun and productive. Our wedding was my absolute DREAM wedding and we couldn't have done it without her. She meticulously maintains the grounds, so decorations are really an accent to the natural beauty. This venue is absolute perfection in every way. The McCreery House was an amazing venue to use. My husband and I adored Julie who owns the venue. She is such a blessing. She helped us find every thing we needed for our special day, kept us in our budget, and made the day go so smoothly. The day was so beautiful. We highly recommend using it. A big thank you to Julie and her staff for making our wedding day so great! Our wedding at The McCreery House at the end of June could not have been better. Julie Marsh is not just a venue owner/wedding planner/day-of coordinator- she is an amazing person and she has become such a good friend. Now that it's all over, she feels like a part of our family. The McCreery House was the first and only real venue that we saw, and I fell in love with it immediately. The house and the backyard are so inviting and Julie made us feel right at home from the very beginning. I just had this gut feeling about the place and about Julie. Having Julie on our team from the beginning and all the way up to our wedding, was absolutely priceless. Her hard work was completely instrumental in making our big day a total success. 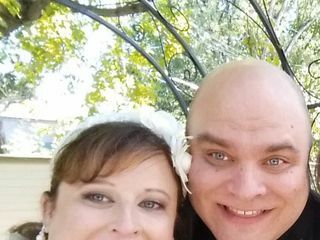 I had very little stress leading up to the wedding because Julie did so much to help us stay on track. She is the most responsive person I’ve worked with- ever. Any questions we had, she had answers. Julie is flexible, open, helpful, incredibly organized, and so easy to work with. Julie recommended our caterer, DJ, and bartender- and they all blew us away. Such amazing service from all of them. We loved that Julie was open to us using whatever vendors we wanted, but that she also had the resources to connect us with people when we weren’t sure who to go with. The McCreery House comes with tables, chairs, linens, plates, glasses, flatware, vases for centerpieces, etc. which made this so easy for us. Julie being so steady, and so well prepared made all the difference in the world. I didn’t have to do a thing on my wedding day, except show up and enjoy. Our guests kept telling us they’d never been to a better wedding. Julie made every single guest feel at home, she was happy to deal with my sassy aunties, she is warm and genuine, and she did so many behind the scenes moves with all of our vendors that everything just fell into place and we were able to enjoy every moment of my entire wedding day. I give Julie & the McCreery House my highest rec! Thank you Sheri! It was a pleasure to work with you and help Miranda plan her big day! What a beautiful October day! 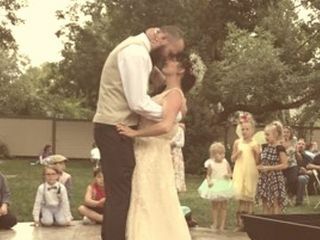 McCreery House was the perfect place for us to have our wedding, the venue is gorgeous during every season and it doubles as a bed and breakfast for you or your party. Julie is extremely accommodating and she was basically my wedding planner (she even called some of my other vendors for me to set things up)! She responded to my questions very quickly, was available to meet with me several times during my planning process, and she helped me set up and took down the whole setup. I highly recommend McCreery House. For its value you will find few other places that give you as much bang for your buck. I got the house to get ready in, set up, take down, tables and chairs, linens, music sound system, servers, ice, chaffing dishes, plates and dining wear, and the tent (cost split between all the couples for the weekend), and a place for me and my husband to sleep for the night for the price. I am so happy we chose the McCreery House! It was decorated so beautifully and the staff was so amazing. I can't say it enough, without Julie's help, I know our special day would not have gone as smoothly. Julie took care of EVERYTHING, she was everywhere I needed her when I needed her. She always had solutions to problems, and was always 10 steps ahead of everything. Julie, if you are reading this, Thank you! Without you, I don't know that I would have done. Awe MLaney you are a doll! Thank you for choosing the McCreery House! Your day was spectacular and having the Wedding Tatooer come from across the country was a unique treat for your guests! The McCreery House was absolutely perfect for our son's wedding. 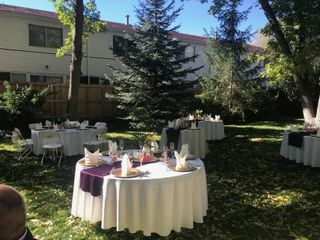 It was a fall morning wedding, the yard was beautiful, the set up with table, etc was perfect. 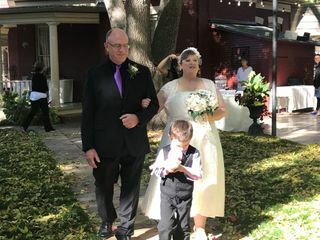 We had a small wedding with family and felt comfortable visiting with family. Julie Marsh was a wonderful host and met our emergency needs with professionalism, ie cake falling apart at the last minute. Julie assisted us with the planning, gave referrals for hair, photographer etc. This was useful since our daughter in law was from out of town and did not know services in town. I would highly recommend the McCreery House for you wedding venue. I am counting on it Victoira! Promise me that you and Kevin will return to CO and visit me soon! Deciding to get married at the McCreery House was hands down the BEST decision and investment my husband and I made during the entire wedding planning process. The venue itself is stunning, boasting a strikingly unique Victorian house wrapped in a gorgeous, luscious garden area. The real gem of the deal, however, is Julie - owner, inn-keeper, and wedding planner extraordinaire. Her impeccable attention to detail and excellent organizational skills allowed the entire wedding planning process to go as smoothly and stress-free as possible. 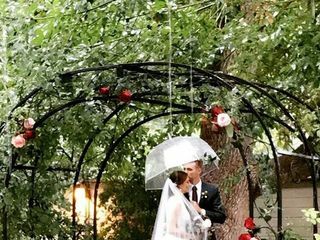 And when the skies decided to pour rain all day on what we had hoped would be a lovely & mild mid-September outdoor wedding, Julie and her team sprang into action, making last minute adjustments and bending over backwards to turn our wedding day into one that we and our guests will never forget. If you choose to get married here, rest assured that Julie will do whatever it takes to make your dream wedding happen, despite any and all unexpected obstacles that may arise. 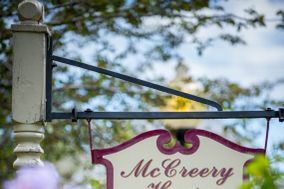 Everything about our experience at the McCreery House was simply wonderful, and I cannot recommend it enough. Julie was amazing and bent over backwards to make our day great! Anyone who is getting married should go speak with julie! My son was married here and it turned out beautiful! Julie was so nice and amazing to work with and my family and I would recommend the McCreery House for whatever event you are having. Awesome, Awesome, Awesome!! 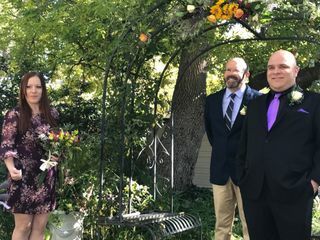 We had our wedding early September. The garden was Beautiful! The staff was SO on top of everything and friendly. Julie helpt make our wedding planning a breeze. The McCreery house was such a beautiful/perfect place to get married, me and my husband got married on the 25th of August this year and it was so incredibly beautiful, we keep getting compliments on how amazing everything was. Julie and the other staff members we're so helpful and friendly, they made sure everything was perfect and stress free. We were truly blessed to get married at the McCreery house. I would definitely recommend this venue to any newly engaged couple. Loved everything about it. Great with working out all the details and just a great pleasure working with I don't have any regrets with the McCreery house. The McCreery House would be the fist place I would recommend to anyone . They really get to know there clients and will try to help out in a pinch if something goes wrong. If I could I would give ten star rating. Our experience with the McCreery House for a wedding reception was wonderful! 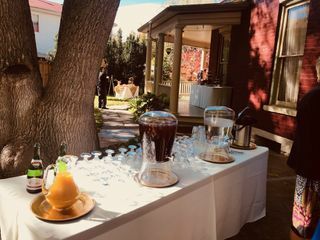 We had a delightful summer evening reception that went flawlessly, thanks to owner, Julie Marsh. Julie met with us several times and promptly answered many questions through email. She had great suggestions and set the venue up beautifully for our event. Julie has great taste and many years of interior design experience, so she has an eye for what will be both beautiful and tasteful. The McCreery House has a variety of linens, dishes, serving items, and staff to make everything simple for clients. There is space both inside and outside to accommodate events and it is a great value for the cost. I am convinced we could not have had a better experience anywhere in planning and holding our reception! Thank you, Julie! This venue is georgious! The photos online looked beautiful but actually seeing it in person was even better. Not to mention the service is outstanding. We hardly had to do anything. Thank you so much!